Gwyn McCormack from Positive Eye shares activities to help children with vision impairment to understand facial expressions and body language, create positive social interactions and develop friendships. Sighted children observe and imitate people’s social behaviours, learning from any visual cues given. This is known as incidental learning. If these opportunities aren’t available to a child, understanding and development of appropriate social behaviour can become fragmented. Having appropriate social skills is crucial to a child’s everyday interactions. They enable the child to interact with others, establish friendships and later develop personal and work relationships. If a child has vision impairment (VI), this can impact on language, cognitive and motor skills acquisition, which in turn affects social development. Poor spatial concepts may adversely affect the child's understanding of different social situations, leading to inappropriate responses and thus undermining their overall social experience. Careful support is needed to help a child with VI take part in conversations with friends. It’s important to let them know when their interactions were positive and how they related to the other children in the group. The child’s interpretation and understanding of these messages will help them to participate in and enjoy positive social experiences at school and in later life. Objective: To help the child be aware of different facial expressions and the emotions they convey. If the child has some useful vision, use printed pictures of different facial expressions, such as surprised and sad. Alternatively, you can make tactile facial expression pictures. A matching set of cards that describe each facial expression. A Lazy Susan (you can get these from IKEA for £5.50). A buzzer (you can get a set of four from Learning Resources for £17.30). Instructions: Roll the dice. When it lands on a six, the child can press the buzzer and spin the Lazy Susan (the buzzer makes the activity exciting and provides some feedback when the child is successful in rolling a six). When it stops spinning, look at or feel the facial expression card that stops in front of the child. Choose the description card that matches the facial expression and have the child make the expression. The game continues until all facial expressions are matched. The winner is the player with the most matches. Variations: You can substitute facial expressions with different body language cards or voice tones using recordable pegs (you can get a pack of six from TTS Educational Suppliers for £39.95). Objective: To help the child understand the social etiquette used when people say goodbye, such as eye contact and waving. Pictures of the child’s friends with the words “Goodbye [friend’s name]” under each. A4 card – trace and cut out child’s hand shape then stick one next to each picture. Find something you can use to keep the pictures together, such as a loose leaf ring binder folder. Instructions: Turn the pages of the book while singing a goodbye song to the child as you wave and say goodbye. Encourage the child to copy and do the same. Use the hand-over-hand strategy to encourage the child to wave as they sing the song. Objective: To offer a practical way for the child to talk about themselves and their interests. A small box with a lid that opens and closes. Items to put in the box that have been selected by the child, such as personal items, hobbies and interests, and photographs. A photo of the child and a label with the child’s name on it (use large print, audio or braille as needed) to put on the top of the box. Instructions: Decorate the box. Add the child’s personal items to the box. Start a conversation with them about their interests and hobbies. You should make a box too with your own personal items so that you can both enjoy exploring the items tucked away in each. Encourage the child to share their box with friends and encourage other children to make their own box to share with the child. Objective: To help children recognise when they have carried out a kind act or when they feel good about doing something caring for someone else. Mini buckets (one per child), labelled with the children’s names (use large print, audio or braille as needed). Pom-poms in a box or jar. Instructions: Hang the buckets where everyone can access them. Use them to encourage, remind and recognise the children's efforts to be kind and caring to others. Ask a child to add a pom-pom to their bucket each time they show an act of kindness. Count the number in each bucket at the end of the week and keep a chart to tally scores over time. 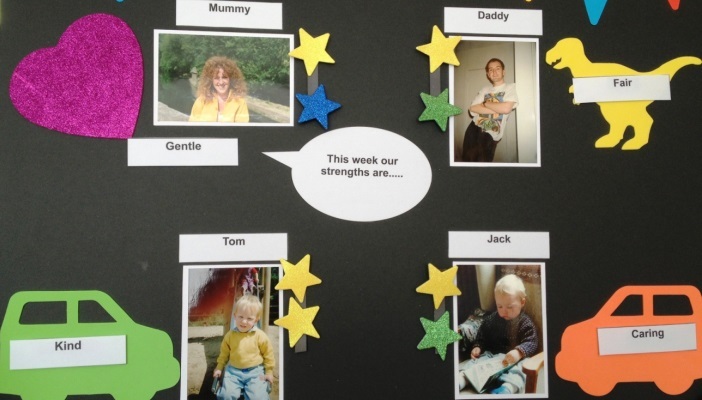 Objective: The chart is a simple way to support a child with VI and their family to recognise each other’s strengths and qualities, supporting and promoting positive self-esteem and emotional wellbeing. The making of it also offers a practical activity that the whole family can have fun with. An A2 piece of card. Things to decorate the card with, such as brightly coloured cut-out shapes and pipe cleaners (Hobbycraft is a great place to find these). A photograph of each family member (approximately A5 in size) glued on mounting paper – you can also include pets if you want to! Labels with the family members’ names on them, for example “Mummy”, “Daddy”, “Tom” and “Jack”. Labels with character strengths written on them. A cut-out speech bubble, which reads “Our family strengths chart”. Arrange the photographs on the A2 card – make an attractive design that everyone agrees with! Use Blu Tack (or Velcro) to attach the photos to the card. Have each person choose and glue a tactile shape next to their own photo. Add Blu Tack to the back of each strength card. Optional: Add an audio label to each person’s photograph, stating their name and what they are wearing – each person could record their own audio label. Taking it in turns, help each other to select a strength label that reflects what they have demonstrated during the last week. For example, it may have been when one of the children showed courage at the hospital during medical treatment. In the first instance, each person should be encouraged to choose their own ticket and then they’re asked by the rest of the family to describe when they used this strength during the week. The family can step in if the person needs a little help. Stick the strength card next to their photograph. During the week, the family need to look out for any occasion when one of them uses their recognised strength. This is celebrated by adding a star to the family member’s photograph each time they are seen using the strength (these can be cut out and attached using Blu Tack). The family meet again a week later on, new strengths are identified and another cycle begins. Objective: To help the child know their own name and the names of their friends. This is a useful activity to help the child understand who is in their group and what they like to do. Once the child knows someone's name, it’s easier for the child to forge a connection and link that person’s name to their voice tone. Photos of the child’s friends. Tactile materials to create key features of each person, for example their curly hair, big smile or thick glasses. Labels with the friends’ names on them (use large print, audio or braille as needed). Instructions: Position all the cards face down. Match each photo card to a name card. The aim is to be the one with the most pairs at the end of the game. Facial Expression Picture Cards (£18 for soft copy) – promote recognition of facial expressions and emotions to improve the child’s competency in social situations with this set of 12 simple black and white facial expression cards, which include a description of each expression on the reverse. Social Skill Picture Cards (£18 for soft copy) – raise awareness of specific social behaviours using this set of 14 high contrast picture cards, each depicting a different social situation or skill with a description on the back of the card. Easy-Easier Posting Box (£25) – consult with the child and listen and respond with this simple, effective concept which offers a practical way to engage with the child about their support. Social Skills Programme for Young Children with VI (£40.50 for soft copy) – help the child to develop social interaction skills using this nine-week programme, which includes lesson objectives, activities and goals, plus a simple monitoring and recording system with graphs to record the child's progress. Thumbs Up (£67.50 for soft copy) – support the understanding of voice tone, body language and facial expression with these 11 role play activities in young people of upper primary/secondary school age with VI.